If there is such a thing as a perfect watch, it should be stylish enough to wear on special occasions but durable enough to wear every day. They aren't always easy to find. Swiss Army’s women’s Vivante with mother-of-pearl pink dial meets both criteria effortlessly. As someone who collects watches, I've always wanted a Swiss Army watch but never found just the right one. That changed when I opened a gift box containing the Vivante last month. The pink pearlescent background shimmers, accented by bold silver-toned Arabic numeral hour indexes (very easy to read), and stainless steel case and bezel with a cabochon crown. The date display covers the six position, and the watch features beautiful Swiss analog quartz movement. The features that make the Vivante stand out and Swiss Army shine. The Vivante is also water resistant up to 99 feet, which means you can wear it in the shower and in the pool without worrying about it. It's an important feature for anyone who frets over wearing their finer jewelry or watches. Another smart feature is the anti-reflective sapphire window. It makes the face virtually scratch resistant, which is a big plus for anyone who needs a watch that can endure wear and tear. Some of the finer details aren't seen so easily seen. Swiss Army watches, for example, are handcrafted. The company also guarantees only first-class stainless steel is processed in its plants. All employees are responsible for quality control, which isn’t surprising given the company’s long and respected history. A bit about the brand behind the Vivante watch. The history of Swiss Army goes back some time. 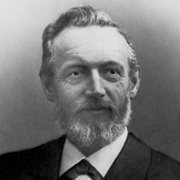 In 1884, a gentleman by the name of Karl Elsener opened his own cutlery workshop in Switzerland, a business venture made possible thanks to the support of his mother Victoria. After being in business for seven years, Elsener and his team delivered their first order of knives for soldiers in the Swiss Army, hence the Swiss Army connection. In 1909, Elsener registered the now iconic cross and shield emblem as a registered trademark. In 1921, he chose the company name Victorinox to honor his mother Victoria, who had passed away. The “inox” part of the name is an abbreviation of the French term for rust-resistant steel, inoxydable. By 1945, Elsener’s original Swiss Army knives were available and widely popular worldwide. It wasn't until 1989 that the company started selling watches in the United States under the Swiss Army brand. Since, the success of the company’s knives and watches paved the way to offering other product lines, such as travel gear, clothing, and fragrances. Part of the allure is in the quality. Swiss Army has one of the better warranty programs. 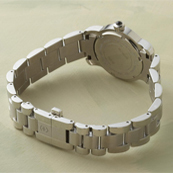 It promises each watch will be free from defects in materials and workmanship for three years. All you have to do is make sure any work done on the watch is by an authorized Victorinox Swiss Army retailer. Otherwise, the warranty will be void. The warranty information isn't always included by resellers on websites. However, the warranty is spelled out in a little book (literally) that accompanies the watch. The packaging is impressive too. My watch came in a heavy box that fit snugly in a larger box with just a silver logo on the lid. Perfect. In checking out other models in the Vivante line, I noticed a nearly identical watch that includes shiny diamonds instead of the Arabic numerals. It’s priced at about $150 more, which is still a nice value although not as functional. Either one beats the more outrageously priced brands on the market. Victorinox Swiss Army’s Vivante Clicks In With A 8.8 On The Liquid Hip Richter Scale. 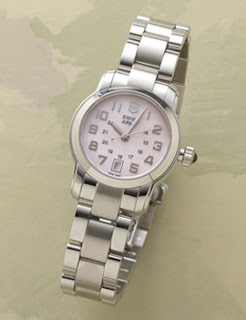 Victorinox Swiss Army’s Vivante mother-of-pearl women’s stainless steel watch is one of the best looking watches for a better value on the market. The company is also environmentally conscious, locating its global headquarters in Ibach, Switzerland, and its North American headquarters in Monroe, Connecticut. The locations help it secure mostly recycled products in its buildings and offices. You can order the Victorinox Swiss Army’s Vivante mother-of-pearl women’s stainless steel watch through Sundance Catalog (about $500). Sometimes you can also find good values at the Swiss Outlet, but not necessarily the specific watch you want. Also, I noticed there is generally no price difference on Swiss Army watches unless they've been discontinued.